Once you have understood the basics behind adding fractions, it is time to look at several more examples. 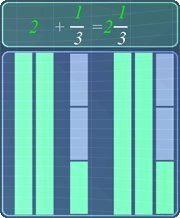 By now, you should know that we can add two fractions directly only if these fractions have like denominators. If these fractions have unlike denominators, it is important to change these fractions (e.g. using equivalent fractions) so that the denominators are the same. If you are not sure how to do this conversion, click here for the lesson. This video shows some more examples on adding fractions. Let's add 2, and 1/3 together. First, let's change 2, into a fraction before adding. We know that, 2 is equals to 2 divides 1. So, when we change it into the form of fraction, it becomes 2/1. Therefore, we can change this to 2/1. Notice that, we cannot add these 2 fractions because they have unlike denominators. Therefore, the only way to add these fractions, is to make them to have like denominators. So, how to add fractions? We can do so, by using equivalent fractions. Using equivalent fractions, we can change this denominator to 3, by multiplying the numerator and denominator of this fraction with 3. This gives the fraction, 6/3. Now, with like denominators, we can just add these 2 fractions. This gives 6 plus 1/3. Now, 6 plus 1 gives 7. Finally, we have the fraction, 7/3. Notice that, 7/3 is an improper fraction. So, rather than leaving the answer like this, it is recommended to change it to a mixed fraction using long division. Here's how. 7/3 is the same as, 7 divides by 3. Now, this division gives the quotient 2. This quotient is actually the whole number for the mixed fraction. Next, we multiply 2 with 3. This gives 6. 7 minus 6 gives the remainder as 1. This remainder, 1, becomes the mixed fraction numerator. So here, we have the answer in mixed fraction, 2 1/3. Now, there something interesting that we should take note. Next time, if we have similar question like this, we can quickly get the answer by just combining the whole number, with the fraction. Next example, let's add 1 2/3 with, 1/3. How to add fractions? Notice that, this fraction is a mixed fraction. So, it is advisable to first convert this fraction to an improper fraction, before we add these fractions. This is to minimize mistakes. To do so, we just multiply 3 with 1. This gives 3. Now, we add 3 with 2. This gives 5, which becomes the improper fraction's numerator. Now, we have the improper fraction, 5/3. Now, since these fractions have like denominators, we can start adding them together. This gives 5 plus 1/3. Adding 5 with 1, gives 6. Now, we have the fraction as 6/3. Notice that, we can simplifying this fraction by dividing 6 with 3. This gives the answer, 2. Next example on how to add fractions, 1 1/2 with 1/3. Notice that, this fraction is a mixed fraction. Again, it is advisable to convert it to an improper fraction. To do so, we just multiply 2 with 1. This gives 2. Now, we add 2 with 1. This gives 3, which becomes the improper fraction's numerator. Now, we have the improper fraction, 3/2. Notice that, we cannot add these 2 fractions because they have unlike denominators. Therefore, how to add fractions? Therefore, the only way to add these fractions, is to make them to have like denominators. We can do so, by using equivalent fractions. Here's how to add fractions. We can make the denominators the same by multiplying 3/2, with the other fraction's denominator 3, and multiplying 1/3, with the other fraction's denominator 2. Let's do so. Multiplying 3/2 with 3, and multiplying 1/3 with 2. This gives the equivalent fractions, 9/6, and 2/6 respectively. The denominators are now the same. Hence, we can now add these two fractions together. This gives 9 plus 2/6. Adding 9 with 2, gives 11. With this, we have the fraction, 11/6. Notice that, 11/6 is an improper fraction. Now, rather than leaving the answer like this, it is recommended to change it to a mixed fraction, by using long division. Here's how. 11/6 is the same as 11 divides 6. Now, this division gives the quotient as 1. This quotient is actually the whole number for the mixed fraction. Next, we multiply 1 with 6. This gives 6. 11 minus 6 gives the remainder as 5. This remainder, 5, is actually the mixed fraction's numerator. So here, we have the final answer as, 1 5/6. You can start by going through the series of questions on how to add fractions or pick your choice of question below.